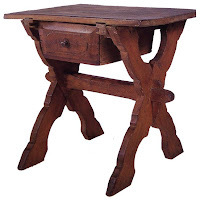 The original sawbuck table (pictured at right) has a raised panel on the drawer front, comprised of sloped edges that rise up to a decoratively-shaped field where the date and drawer pull are found. All of the raised panels I've ever made have had flat slopes, but the sawbuck's are concave (cove profile). If you don't have a moulding plane that matches the cove's shape (raising hand) and believe it's too dangerous a task to be performed on a table saw (raising both hands), then you need to get resourceful. It's all about stock removal. How you achieve it depends on the tools you have and your personal preference. The top edge of the slopes sits a bit lower than the decorative field, so I reached for a tool I'd never used before, a Record 043, to define the depth of the recess and the width of the slopes. Even though I spent time sharpening the Record's blade and flattening the fence and depth stop, it worked very poorly—tearing up the wood like kids unwrapping Christmas gifts. It w as difficult to keep the fence tight against the edge, due I think to the type of wood—curly cherry. So I employed my Sargent combination plane, which worked superbly. 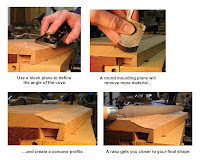 From there, a block plane, moulding plane, rasp, scraper, and sanding block finished the profile. Some of these steps could have been skipped, but I was figuring this out as I went along. I'm sure there are a number of other ways to create a cove so feel free to share your own creative methods. A very creative way of resolving a difficult problem, Kari. Too bad you didn't contact me before though. I sell all kinds of concave and convex japanese planes (both along and across). You could probably find one with a wide enough radius and spare yourself the block plane and rasp times. Thank goodness tweets are only 140 characters, lol. Sorry to hear about your Record 043 troubles, Kari! Did you only get the tearout with cross-grain? Or did you get it when ploughing grooves? I haven't had a chance to fully tune mine, but out of the (tatty) box, it worked remarkably well in both mahogany and maple. It is a ways into the blog, but his photos and descriptions are top notch - worth checking out. As usual, looks like you figured it out without any problems, and after all that's what it's all about - the results. 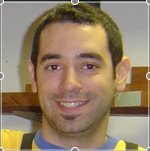 On another subject, (one of your July, 2008 posts), I owed you a great big THANKS! I have gone back and read all your posts and this one inspired me to go out and try to carve a star. Much to my own amazement I not only did it, but it actually looked halfway decent. Now I am going to try to learn to carve letters as you described in your other posts. This is something I have always wanted to learn, but I didn't think I had the ability. Thanks for the confidence boost and inspirations, your information is as creative and informative as anything I have found. Keep up the good work! I've seen people cove on the tablesaw, and it gives me the willies too! I know the tailed devils leave a bad taste, but was a router table completely out of the question? I've done raised panels there, and as long as you sneak up to your final size, I haven't had a problem or found it to be particularly scary. Ethan, I think the trouble with the plane had everything to do with the type of wood. Planing curly cherry is tough with any plane (IMO). I'll give it another go with pine sometime. Thanks for the link to Tom's blog--I'll check it out. Silverback, that's great! I'm so glad to hear the posts helped. You are well on your way to becoming a proficient letter carver! Jon, I imagine that routers would be great for this. I've only cut small coves with my router table and it worked great. I don't have a bit this large, though, and I'm trying to use handtools as much as possible on this project. I did "cheat" at times and used my TS and band saw. Oh, yeah, and planer. Guess this piece isn't too authentic, after all! I resorted to the table-saw method when I needed to cut a big cove - about 4" across and 1" deep - in some very hard Casuarina. You can see the results in my Bao bei wu cabinet. Much as I like the quiet and absence of dust you get with hand tools, I think I would have struggled with this job. At the end of the day the 1 tonne table-saw is just another tool to be respected and mastered. And you certainly have to respect it doing coves like this. But a solid saw, solid fences, plenty of hold-downs and a lot of focus can make it quite safe. Mark, your display cabinet is gorgeous--no surprise! 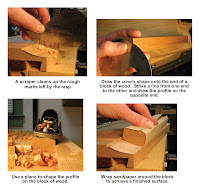 It would be difficult (at best) to achieve that level of perfection with handtools. Thanks Kari. Of course there was plenty of hand finishing as well. I used a shaped sanding block just as you describe. Looking at it again I see that the profile is elliptical so I must have canted the saw blade as well. This would be that much harder again to hand plane. I'm sure there are people with the skills and right tools to do this. But even if you're making for personal pleasure it's sometimes nice to do a job the efficient way so you can move on to other enjoyable tasks.